In Seeds: The Three Birds of the Apocalypse, you can manipulate or just watch seven different life forms as they wander, hunt, and multiply. What sets Seeds apart from traditional artificial life programs is the colorful animated life forms. Though maybe not as useful in research, these creatures are more fun to watch than basic gliders and geometric shapes. There�s no real story or defined goal for the player in Seeds, but that doesn�t keep it from being more fun than a lot of games that have these things. The left mouse button creates new plants and animals (Press the number keys 1-7 to determine which creature you place) and the right mouse button erases existing creatures. This game inspired me to try a similar project myself, and if you've played any kind of artificial life game made with Game Maker, it�s likely that it was either inspired by this one or by another that was inspired by this one. This is simpler than some of the other Iteration Games projects, but it's just as polished and habit-forming. Recommendations: The 3 people who like Seeds also like the following games. Imagine this as a screensaver. Now THAT would be the coolest thing ever. Without the interaction of course...just imagine that. Your computer is sitting there, and suddenly big words fade in...SEEDS. Then you could sit and stare at your virtual ecosystem! I don't get what all the fuss is about, all you do is plant stuff on the ground and watch them grow why'll other life forms come along. There's no point to it. The graphics look alright, but the game needs music. Otherwise I think the game is very boring. There are many game maker games which I was not entirely sure about on first glance. Wally I was unsure of, Eerie Lights I was a bit scared of. When I was seven, I hated nintendo. Seeds is such a game. Impovershed in plot and extensive help guides, it nevertheless attaches itself to you. Sure, I've played mario as much as the next person, but little gems like this are really what keep the gaming industry going. Yes, it is a bit cartoony, but the animations of it are impossible to argue with. I mean, sure, you can complain that you weren't able to see that the white creature had an eye before you saw Tapeworm's screenshot, or that the white flying things are birds and not airplanes (I made both mistakes), but such things don't really distract you from the game. The animations, which unfortunetly aren't displayed here, the quivering of the fire-looking creatures, the burst of energy the turtle-looking creatures relinquish when eating leaves and spawning blue stars, and the sheer delight of watching a fire-creature split into tens of pieces while being placed in the middle of an overly fertile area, are amazing. Overall, it all fits together nicely. There are few games in which you wish you had godlike powers to alter the game and then you end up realizing that you do. Need I say more? You watch these creatures and plants interacting with each other, studying them, and then when you see one of them in danger, you're able to leap back in and create a plague of them. 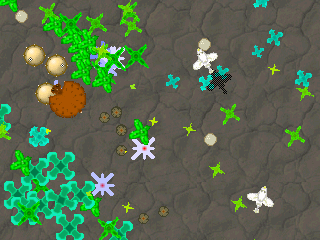 You can control the foundations of the creatures simply by planting a mass multitude of plants. And then you get to destroy them all and start from scratch. It may not sound like much, but you play it and see what I mean. I haven't really been in the game maker thing for too long, oficially anyway, as I started a year ago and looked at three games before packing it away. Nevertheless, this is the kind of game that shows what you can do with game maker, and so I credit it as such. Yes, at first I thought, this is boring now, I've been at it for an hour, and it's lost all its interest. Well, that worked for about a day. Then I tried it again, and the cycle began all over again. I'm past playing it for more than an hour now, but I still pull it out when I've got nothing better to do. And often, I deliberately forget I've got nothing better to do so I can play it guilt-free. Aside from psychological innuendo, however, I find this game continues to have replay value even when you wish you were a mere mortal among them. And hence it continues. I planned to get a decimal approximation, but I decided to play seeds instead. To hell with everything else. Seeds is a very fun but limited life simulator. It was one of the first life simulators and inspired many such as Elu by Tapeworm. It has seven species; two plants, four animals and one bird. It is fun to just watch them and keep a balance of life. As sometimes certain species take over. You can add species and watch them grow. Its amazing how something can be so small yet so powerful.